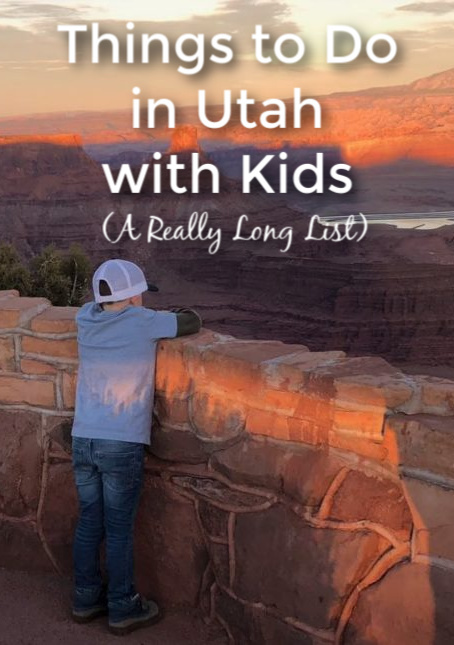 There are so many exciting things to do with your kids in Utah that you could easily spend all your vacations in the Beehive State. 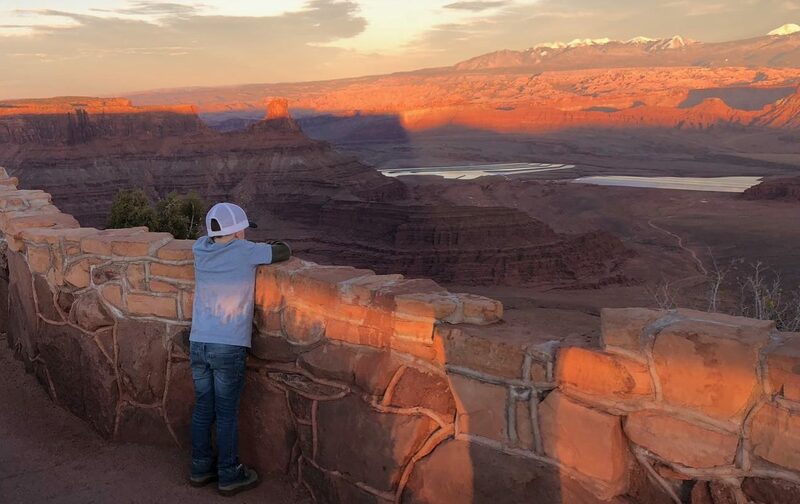 However, your family might want to visit another state at some point, so you will have to prioritize your time in Utah: do you want to visit the Big Five National Parks? See dinosaur bones? Go white water rafting? Soak in hot springs? Get salty in the Great Salt Lake? Shimmy through a slot canyon? Buckle up (literally…this is an expansive state, and there will be long drives involved), and get ready for enough adventures to fill up a lifetime’s worth of Instagram posts. Utah’s Big Five are some of the jewels of the National Park Service: Arches, Bryce, Zion, Canyonlands, and Capitol Reef national parks. They are all in Southern Utah, but seeing them all in one trip would take five days and a real commitment to driving over hiking. You can see an itinerary like that here if you’re feeling crazy. A more reasonable choice would be to choose a couple to explore, making sure to look for adjacent points of interest. 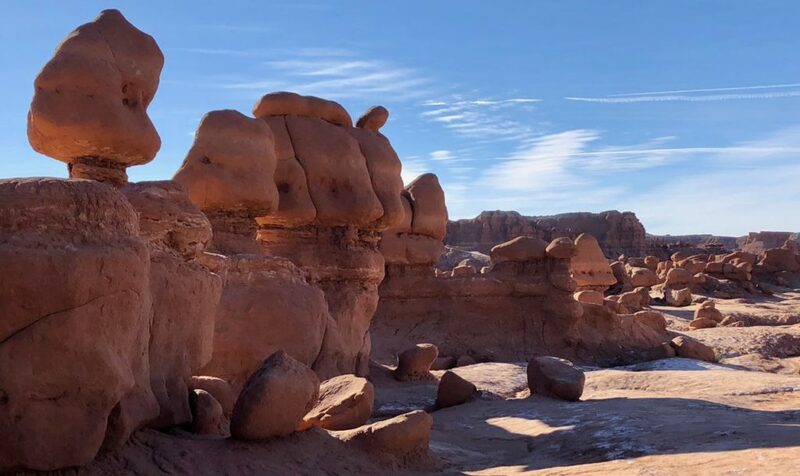 For example, around Arches National Park, you’ll find Dead Horse Point State Park as well as the ancient Mill Canyon dinosaur tracks on BLM (Bureau of Land Management) land — you can read more about why we love those spots around Moab so much here. 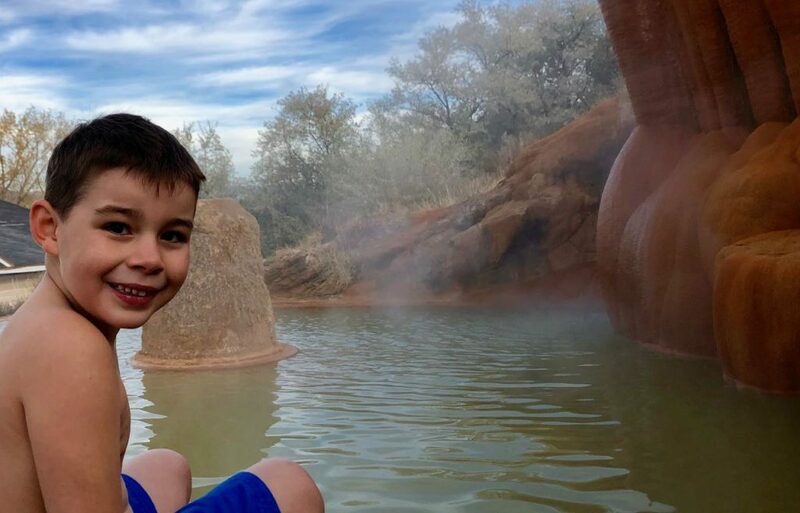 Mystic Hot Springs is just one of Utah’s kid-friendly geothermal hot springs. Even after all this, it’s worth making the trek to Vernal, Utah, on the east side of the state. Vernal doesn’t call itself “Dinosaurland” for nothing, and just entering the town will delight anyone who loves dinos, kitsch, or kitschy dinos. It’s the closest town to Dinosaur National Monument, which straddles the Utah/Colorado border. Here, in the quarry exhibit hall, you can see dinosaur fossils still embedded in rock. Vernal is also home to the Utah Field House of Natural History State Park Museum, which is a function of the Utah state park system and another dinosaur museum the whole family will love. You’ve seen 127 Hours, and figured a) you’d never end up in a slot canyon because you don’t plan on putting your toddler in a climbing harness and b) it’s not worth risking losing a limb. The truth is that slot canyons make for gorgeous photos and fun little hikes, and while you could rappel down into some crazy canyons and apply for permits to backpack through miles and miles of wilderness, you could also just explore a mile or two of some of the easier trails, take some nice photos, and hightail it out of there. Trust me, nothing screams “Utah vacation” like a family photo in a stunning slot canyon (okay, except maybe a family photo on envy-inducing slopes.) This article from Utah.com has some good slot canyon options for beginners; I got my easiest kid-in-a-slot-canyon picture in Leprechaun Canyon. 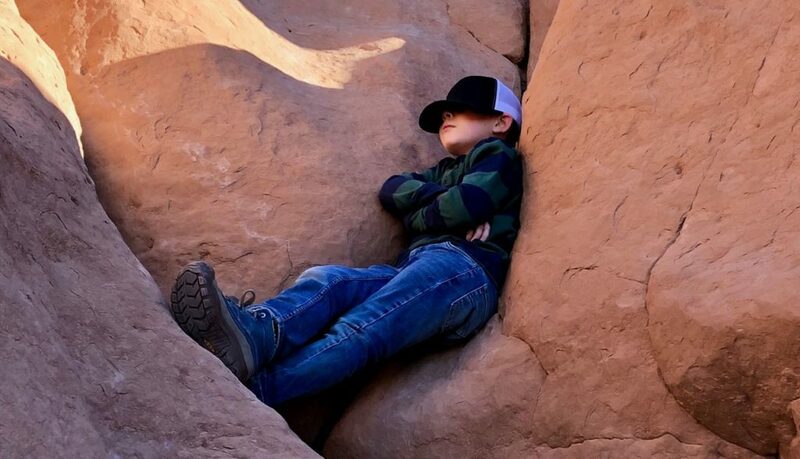 Hiking through Utah slot canyons is hard, says this kid. Utah’s plethora of fossils means you can actually just drive up to some dusty quarry and dig to your heart’s content. This is the kind of activity that thrills nerdy adults and kids alike, as well as anybody who likes to break rocks. The private quarries that allow you to do this have various types of fossils available. When we went fossil hunting, we headed to a quarry that was technically in Wyoming for fish fossils, but there is a U-Dig Fossils just outside of Delta, Utah. 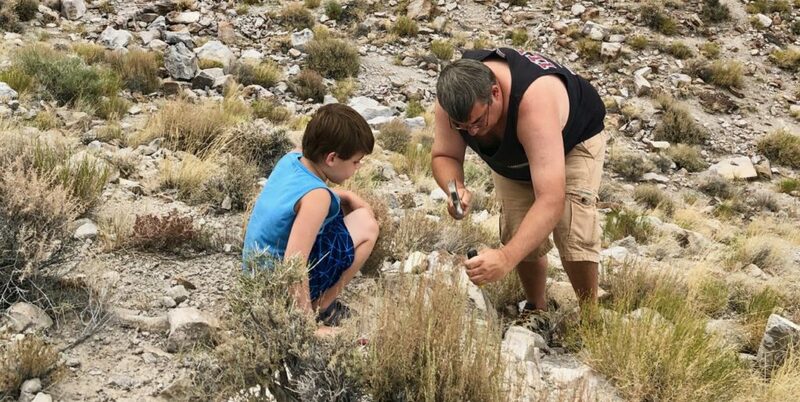 If you’re lucky enough to be over age 16, the Utah Field House of Natural History State Park Museum in Vernal runs a paleontology program in the summers where you can actually learn to look for fossils alongside their experts for a week. You can also dig for fossils legally on BLM land if you know where to look. The city of Vernal’s website recommends you ask at the local BLM office for where to go. This site has some other recommendations if you really feel like going it on your own. If you like white water rafting, Utah’s got you covered. It has some of the most exciting whitewater in the West. Multi-day rafting trips out of Moab are always popular, some of which go clear down to the Grand Canyon. People also raft the section of Green River below Flaming Gorge Dam near Vernal. There are lots of professional outfitters in both places. If you want to raft sections yourself, you will need a permit. Utah doesn’t claim “the greatest snow on earth” for nothing. Depending on where you are staying in Salt Lake City, you could be at a ski resort in under 30 minutes. SkiUtah.com has a complete listing of ski options as well as snow reports. 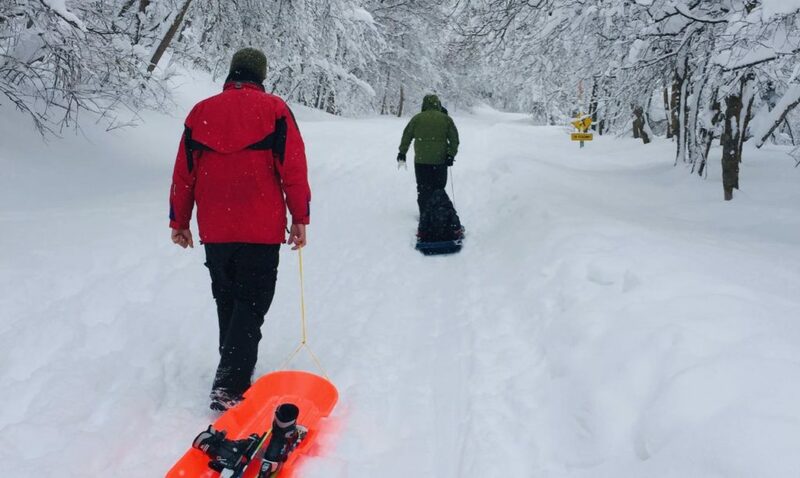 If there’s snow in the city, pick up a sled at the nearest store and find a hill. Sugar House Park in Salt Lake City is a popular spot to sled. More serious tubing hills can be found at Soldier’s Hollow and in a few other locations around the valley. Snowshoes and cross-country skis can be rented at the sporting goods store REI; if you know anyone who attend or works at the University of Utah, they rent equipement there, too. There’s a great online listing of all the snowshoe trails on in the Wasatch Front here. Snow activities will always top the list of things to do with kids in Utah in winter. Yes, you might end up dragging both the kid and his baby skis through the snow, but it will still be the greatest snow on Earth. Utah Olympic Park in Park City is one of our favorite day trips to take with the kids from Salt Lake City. Among other attractions, they have a little Olympics-themed museum, a bobsled for photo ops, a training pool for ski jumpers, ropes courses, zip lines, and tubing hills. It’s a great place to visit for free, with some of the more extreme activities costing money. But in the winter, you can actually ride in a real life bobsled. Frankly, it looks terrifying to me, but if you try it out, I’d love a full report! Utah’s geology is ripe for mineral hot springs. This is the state in which you can soak your cares away. Or it would be, if you weren’t traveling with noisy children. Kids love warm water to swim in, though, so a tour of the magical hot waters the state has to offer may be in order. The Homestead Crater in Midway is semi-famous as the only place in the continental U.S. where you can scuba dive in warm water; you can read about our visit here. If you don’t want to swim in the actual crater, the hot spring water is piped in to the lovely hot tub at the Homestead Resort. Mystic Hot Springs in Monroe was indeed mystical and my kids had a great time there. Crystal Hot Springs in Honeyville is also a popular spot for families. These are all privately managed and involve entrance fees. There are other hot springs found on public lands, many of which require a hike, and all of which would be at your own risk. The closest to the city is Inlet Hot Springs near Utah Lake. Visit Goblin Valley because you’re a massive Galaxy Quest fan. Or just because kids absolutely love to climb these hoodoos. Goblin Valley: My personal claim to fame is being actually present in Goblin Valley during the filming of Galaxy Quest! Completely coincidentally, of course. Bonneville Salt Flats: This wide open space west of Salt Lake City has been featured in many movies, including scenes from Independence Day and Pirates of the Caribbean: At World’s End. Lehi: Lehi Roller Mills, about 30 minutes south of Salt Lake City, was the filming location for the original Footloose. Monument Valley: This stunning area of Southern Utah has been the backdrop for many films, including Billy the Kid, 2001: A Space Odyssey, Back to the Future Part III, Forrest Gump, Mission Impossible II, The Lone Ranger, and Transformers: Age of Extinction. Arches National Park: Kids may recognize familiar scenery from Indiana Jones and the Last Crusade and Hulk. Lake Powell: Can be seen in Gravity, Doctor Who: The Impossible Astronaut, Planet of the Apes, and Maverick. East High School in Salt Lake City: The location of High School Musical. Up House: No, the cartoon Up wasn’t filmed in Utah. But there is a replica of the Up house in Herriman, a suburb of Salt Lake City, and kids and adults alike will get a kick of out of posing in front of it. Sure, you’ll be driving a long ways to the middle of nowhere essentially for a photo op, but where else can you stand in four states at one time?! If you happen to be in southeast Utah anyway, swing by for the opportunity to be in Colorado, Utah, New Mexico, and Arizona ALL AT THE SAME TIME. Nerdy kids (like mine) get a kick out of this. There’s a small visitor center here, along with a few booths selling food and Native American crafts and souvenirs. Four Corners Monument is managed by the Navajo Nation Department of Parks and Recreation and there is an entrance fee. Salt Lake City has a plethora of kid-friendly locations to keep you busy. There are children’s museums, natural history museums, pioneer museums, aquariums, zoos, planetariums, and working farms to visit. Our absolute favorite will probably always be This Is The Place Heritage Park, but you can read about all the others you shouldn’t miss in our round up of things to do with kids in Salt Lake City. What’s a visit to Utah without seeing the largest saltwater lake in the Western Hemisphere? If you fly in to Salt Lake City, you can view the transcendent colors of the salt flats and the salty lake from above. When visiting from the ground, things get a little murkier. The levels of the lake rise and fall, making the shoreline a moving target. If you want to see the lake up close, Great Salt Lake State Park is only about 15 minutes west of the city, and a good spot if you just want to view the lake up close. Antelope Island State Park is a more popular place for families to visit; although it’s farther from the city, on Antelope Island you can hike, bike, view lots of wildlife, and take the kids down to the edge of the water to dip in as well. For a unique, off-the-beaten-path place to float in the Great Salt Lake, visit the Spiral Jetty outside of Corinne, Utah. This piece of land art can either be visible or submerged, depending on the levels of the lake, and you may have to hike past it on the salt crust to get to the lake. The colors of the water at this location are gorgeous,especially at sunset. It’s one of our favorite day trips from Salt Lake City, and you can read here about how to get there and why I love it so much. Digging for treasure on Topaz Mountain. Drive around much, and you’ll notice Utah’s got a lot of rocks. Guess what? Some of those are on public land, and could be your rocks! Topaz Mountain, for example, is on BLM land and hides within it topaz and other semi-precious gems. It’s another of our favorite day trips from Salt Lake City, as it’s a couple hours away, but well worth the drive. You can search for topaz on your own, but you may not be very successful on your first attempt (we certainly weren’t…). For a better chance at taking home true gems, go with an outfit like Topaz Mountain Adventures. Even if you don’t find anything valuable, kids who love to hit rocks with hammers (like my monsters) will love this stuff. If you choose to see the Spiral Jetty, on the way there you’ll pass Golden Spike National Historic Site. Don’t miss it! In 1869, the Union and and Central Pacific Railroads coming from the east and west met at Promontory Summit, Utah Territory. This spot is now in the middle of nowhere, northeast of Salt Lake City, but absolutely worth the drive for train or history buffs. In addition to the indoor visitor center, there’s an array of historic locomotives, pioneer-era handcarts, and a plaque on the ground at the exact spot where the final spike was driven. Petroglyphs in Capitol Reef National Park, just hanging out by the side of the road, astonishing visitors. 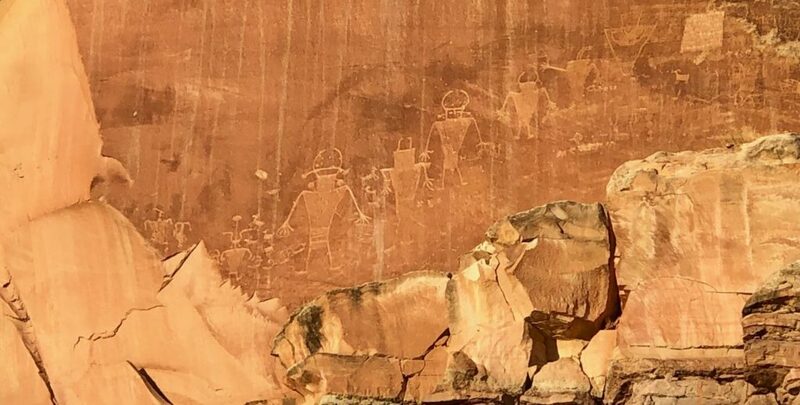 Utah has some incredible history, and there are lots of places where you can see pictographs and petroglyphs left behind by the ancient cultures that called this place home. Fremont Indian State Park and Museum is a great place to explore the history of the Fremont Indians. For easy viewing of amazing petroglyphs, take a drive through Capitol Reef National Park. For one of the largest collections of petroglyphs in the country, but one that will take a little longer to get to, visit Newspaper Rock State Historic Monument in Bears Ears National Monument. You’ll find petroglyphs and pictographs at multiple other spots throughout southern Utah, too, so make sure to look for some wherever you wind up! If your kids can’t handle the summer snow-less season, and really need to bring those sleds and snowboards out of storage, head south to Coral Pink Sand Dunes State Park. Sand dunes are popular places for ATV riders, but you can also sled and snowboard on them, or just let the littles play in the sand. Little Sahara Recreation Area and White Wash Sand Dunes, both on BLM land, are other great places to play in nature’s sand in this landlocked state. Are you exhausted yet? Is this enough? I mean, you could also hike the Uinta Mountains, waterski Bear Lake (and while you’re there make sure to have a raspberry shake), go fishing, explore Mormon history at Temple Square and the Beehive House, or stay on a houseboat on Lake Powell. There’s so much Utah to see, and so little time!